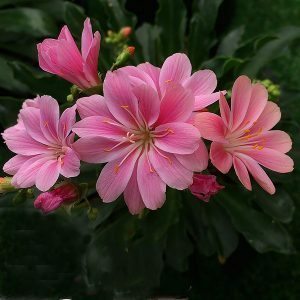 Low growing perennials with attractive flowers, Lewisia are a spring flowering plant with attractive flowers in a range of colours. Colourful little rock garden plants Lewisia are mainly found in nurseries as hybrid forms. A small perennial plant from the Rocky Mountains where they are known as ‘Bitter Root’, they form attractive rosettes of green foliage, with flowers rising well above in spring. They are naturally found in rocky areas, growing in semi shade in a well drained humus rich soil. The hybrids that we see offered for sale come in flower colours from white through top pinks and yellow. Excellent in a protected position in the garden where the flowers add good colour in spring, and also suited to growing in containers. Once established hay are an easy care plant. Drainage is the most important factor in growing these colourful plants. 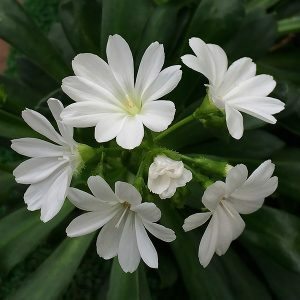 Without good drainage, Lewisia tend to suffer from rot. The natural habitat is growing in the crevices of rocks, so they make excellent plants for growing in rock gardens, in dry stone walls as well as in containers. You can amend the soil by adding extra drainage material such as grit or fine gravel. You can try to raise of ‘lift the plant up’ a little in damp areas. Although they naturally grow in near to full sun, in warmer climates they will require dappled shade to grow well. After the first flowering they should be watered, as this will promote a second flush of flowers. This process can be repeated. It is important to let the soil dry between waterings, constant moisture causes problems. Provide very good drainage in winter. Grow them in semis shade. Use a humus rich yet well drained soil. Provide a little extra water during long hot periods.